Hamdi Ulukaya, the founder and CEO of Chobani, allegedly bribed a former employee at Fage to reveal the rival's recipe for Greek yogurt, according to Ulukaya's ex-wife. A recent court filing obtained by The Huffington Post accuses Ulukaya, a Turkish born immigrant and now billionaire, of repeatedly bragging about how he "traveled to Europe and bribed this employee with 30,000 Euros." The allegations are being made by Ulukaya's ex-wife, Ayse Giray. The former couple has been locked in a legal battle since 2012, when Giray first claimed Ulukaya denied her a stake in the company. When asked about Giray's allegations, Chobani told HuffPost in a statement that "the allegations are completely baseless and without merit." The recent accusations were first reported Friday by the New York Post, which has run a number of unflattering stories about Chobani in recent months. While Fage introduced Greek yogurt to American customers nearly a decade before Chobani, Chobani quickly trumped its rival. 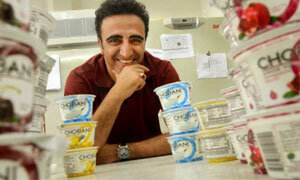 In 2012, AdAge reported Chobani commanded 47 percent of the Greek yogurt market, compared to Fage's 14 percent. Greek yogurt represents more than 40 percent of the $7.4 billion American yogurt market, Reuters reported.